I just saw on Facebook that a local apple orchard has some varieties that are ready for picking. Apple season is here! That means having pounds of apples in our house at all times. And since we can’t possibly eat them all before they go bad, that also means lots of baked goods that incorporate apples. One recipe that I will turn to to use up our overabundance is this apple cake with maple frosting. 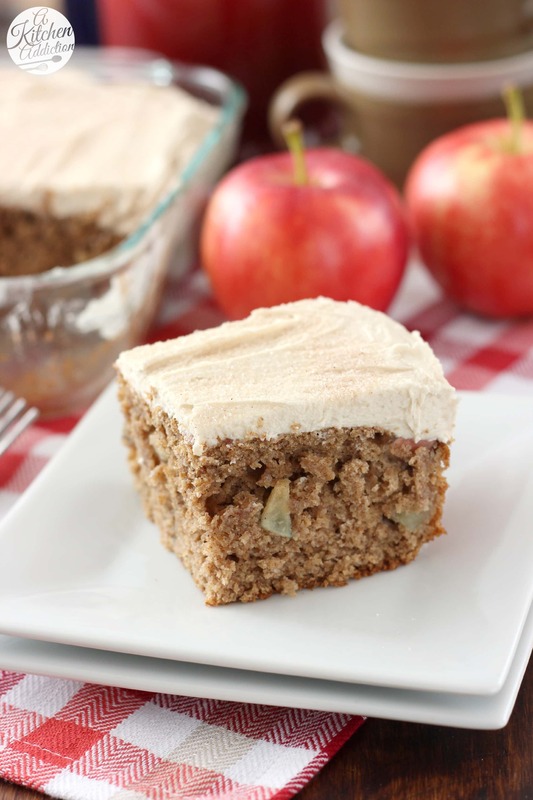 This cake is filled with chopped apples and warm hints of cinnamon, nutmeg, and allspice. A combination that makes the house smell amazing, by they way! 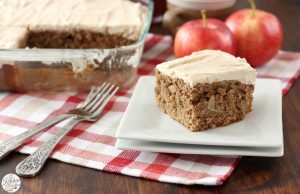 Yogurt and applesauce are used in the cake to keep it tender and moist, and whole wheat flour adds a boost of whole grains. Because it’s reasonably healthy, this apple cake would make a great breakfast or snack if you leave off the frosting. Of course, there would be no judgement if you didn’t leave the frosting off! The maple frosting is just sweet enough to add flavor without being overpowering. Maple and apple is starting to become a new favorite combination. Don’t be surprised if you see more of it in the upcoming months! Preheat oven to 350. Lightly spray an 8x8 or 9x9 inch baking dish with non-stick cooking spray. In a stand mixer, or with an electric mixer, beat together butter and honey (or sugar) until creamy. Beat in eggs one at a time. Add in yogurt, applesauce, and vanilla extract and beat until thoroughly combined. In a separate bowl, whisk together flours, baking powder, baking soda, cinnamon, nutmeg, allspice, and salt. Add dry ingredients to wet ingredients and beat until combined. Stir in apples. Bake for 20-30 minutes or until toothpick inserted in the center comes out clean. Remove to a wire rack to cool. While cake is cooling, prepare frosting. Beat together butter and 2½ cups confectioner's sugar. Add in extracts and milk. Beat until smooth. If more confectioner's sugar is needed, add 2 tablespoons at a time up to another ½ cup. Spread over cooled cake. This looks totally perfect for fall! You’ve totally got me craving apple cake now. My dad adores. I should bake one up for him. can i sub real maple syrup for 1/2 the honey? Yes! Or you can use sugar. Hope that helps! This cake looks incredible, Jessica! What a great dessert to ring in the weekend with! Love the maple frosting, too. Delish! I can only imagine how amazing this made your house smell! Apple cakes are the best! I love this! 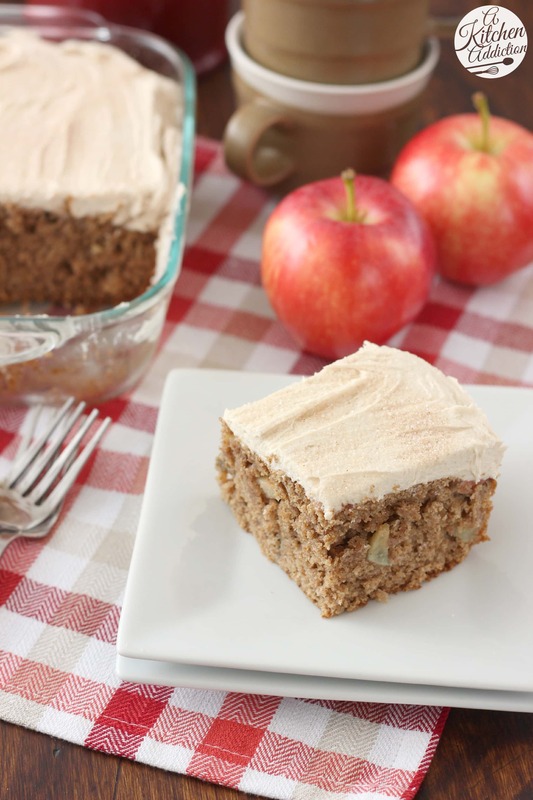 Apple desserts are my favorite in the fall (sorry pumpkin..) and with maple?! Sign me up! It’s fall in cake form! I love our local apple barn, and can’t wait for it to open for the season! This is a perfect fall cake. I actually think I’m more ready for apple baking than pumpkin baking! So excited to get lots of apples into my life. THis cake will definitely be a staple. Love the maple apple combo! Yay for apple season! 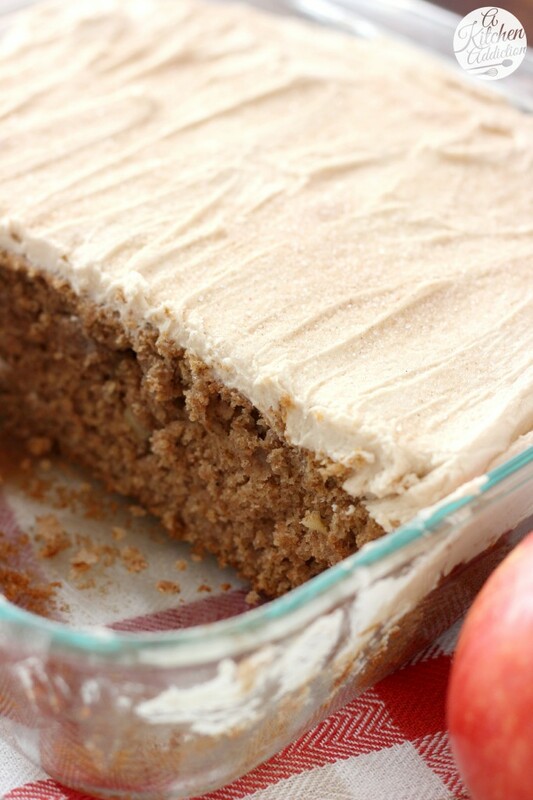 I LOVE baking with apple – this cake looks absolutely delicious. Especially with that maple frosting! I would die for this cake – and that frosting. GIVE ME A SPOON! Pinned! Leave the frosting off? No thank you! 😉 I love the maple in the frosting – I can only guess how wonderful it pairs with the apple! I love apple season! Can’t wait to go apple picking (you can do that in Cakifornia!). This recipe looks delicious. I am definitely going to have to make it! Looking forward to making this tomorrow. We are Vermont Maple Sugar Makers and I am always looking for new Maple recipes.